“We abuse land because we regard it as a commodity belonging to us. When we see land as a community to which we belong, we may begin to use it with love and respect” (The Land Portal Video). The vision of the Land Portal is to improve land governance to benefit those with the most insecure land rights and the greatest vulnerability to landlessness through information and knowledge sharing” (The Land Portal – Vision). 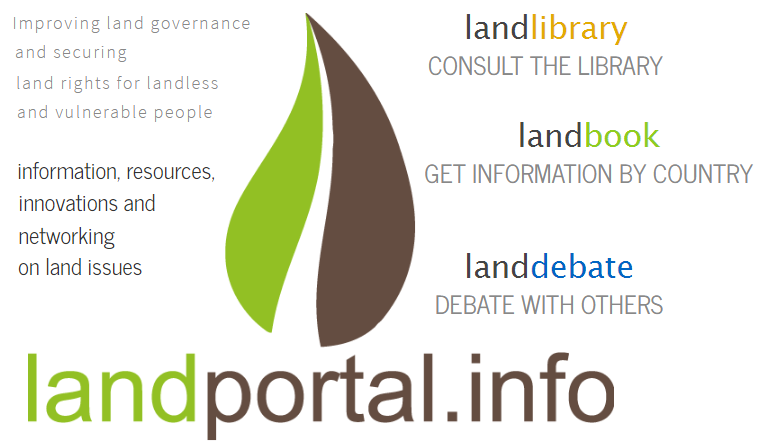 The Land Portal was launched by the Land Portal foundation (a non-profit organization headquartered in Groningen, the Netherlands) in 2014 for the collection, sourcing, and searching of otherwise fragmented and inaccessible data and information on land governance and land use from diverse sources, produced by governments, academia, international organizations, indigenous peoples and NGOs. The Land Portal Policy Advisory Committee includes several organizations and networks from the Land Governance community, such as: International Land Coalition (ILC), International Fund for Agricultural Development (IFAD), Food and Agriculture Organization (FAO), and the UK’s Department for International Development (DFID). The Land Portal Hub – a central entry-point (presented in four languages: en - fr - es - pt) into the Land Portal - provides user registration, cross-site searches of land-relevant data sources, newsletter subscription, information on news and events. By combining public data, published information, and first-hand knowledge, the portal has built a strong foundation as the online destination for land information and continues to develop as the leading source of information and data to support improvements in land governance across the globe. In addition to documenting land rights, the Portal also encourages social information exchange through blog posts, debate and networking (Land Portal Community), with a particular focus on land governance stakeholders in the global South. identifies and addresses land governance information gaps. Open culture and collaboration – Ensuring there is capacity for formal and informal collaborations with partners, and engaging in regular interaction with a wide community of stakeholders and interested parties” (The Land Portal – Vision). consume and reuse the data by different means (i.e. raw data download at the data catalog; linked data and SPARQL endpoint at RDF triplestore; RESTful API; and built-in graphic visualization framework” (Data on the Web Best Practices Use Cases & Requirements, W3C). - a catalog connected to comprehensive country and thematic pages with linked open data on land governance from diverse sources around the world (visualized through an interactive world map), indicators and widgets. The Land Book follows the classification made by the Geopolitical Ontology from the FAO of the United Nations. providing an open discussion forum catalyzing and curating dialogues and high-level debates amongst land experts and practitioners from Land Portal Community through sharing news (recent ones are visible on the main page of the portal) , events, blog posts and online discussions. Portal pages can also be browsed accessing the dynamic Sitemap organized in a hierarchical fashion that allows a systematic exploration of knowledge from aggregated content. Did you know, that the Land Portal Foundation and the AGROVOC team collaborated to extend the coverage of AGROVOC in the domain of land governance and tenure and that the Land Portal has now a separate ontology based on AGROVOC therefore also GACS mapped? AGROVOC multilingual thesaurus is a reference taxonomy to which all the land and development taxonomies developed by local communities could be mapped. These linked taxonomies will enable the semantic interoperability and will facilitate the content discovery. Read more about AGROVOC in AGRIS: providing access to agricultural research data exploiting open data on the web. Read more about GASC in The GASC Project. Semantics for Open Data.